ESA’s Herschel Space Observatory captured asteroid Apophis in its field of view during the approach to Earth on January, 5-6, 2013. 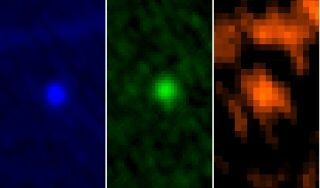 This image shows the asteroid in Herschel’s three PACS wavelengths: 70, 100 and 160 microns. A European space telescope has captured new images of the huge asteroid Apophis, revealing that the potentially hazardous object is actually bigger than previously thought — and you have a chance to see the space rock yourself in two free webcasts tonight (Jan. 9). Asteroid Apophis has long been billed as a "doomsday asteroid" because of a 2004 study that predicted a 2.7 percent chance of the space rock hitting Earth when it passes within 22,364 miles (36,000 kilometers) of the planet in April 2029, European Space Agency officials said. Later studies proved, however, that the asteroid poses no threat to Earth during that flyby, but astronomers continue to track the object since it will make another pass near Earth in 2036. At about 36 hours from the minimum distance (9.3 million miles or 15 million kilometers from Earth), potentially hazardous asteroid Apophis was imaged again with the Virtual Telescope, on Jan. 8, 2013. Today, ESA officials announced that its infrared Herschel Space Observatory has discovered that Apophis is about 1,066 feet (325 meters) wide, nearly 20 percent larger than a previous estimate of 885 feet (270 m). Tonight's two free webcasts will stream live views of Apophis from telescopes in Italy and the Canary Islands tonight (Jan. 10). The webcasts, offered by the stargazing websites Slooh Space Telescope and Virtual Telescope Project, will show Apophis as a bright light moving across the night sky. The asteroid is too small to be seen through small backyard telescopes. The Slooh Space Camera webcast will begin at 7 p.m. EST (0000 Jan. 10 GMT). The Virtual Telescope webcast will begin an hour later at 8 p.m. EST (0100 GMT). You can watch both live webcasts of asteroid Apophis here on SPACE.com tonight. Apophis will be just under 9.3 million miles (15 million kilometers) from Earth at the time of tonight’s webcasts, amateur astronomer Gianluca Masi of the Virtual Telescope Project told SPACE.com. "Alone among all these near-Earth asteroids that have passed our way in recent years, Apophis has generated the most concern worldwide because of its extremely close approach in 2029 and [chances of a] potential impact, albeit small, in 2036," Slooh president Patrick Paolucci said in a statement. An artist's rendering of the asteroid Apophis. In addition to asteroid Apophis, astronomers regularly scan the night sky for asteroids that may pose a potential impact threat to Earth. NASA's Near-Earth Object Office and Asteroid Watch program is based at the agency's Jet Propulsion Laboratory in Pasadena, Calif.